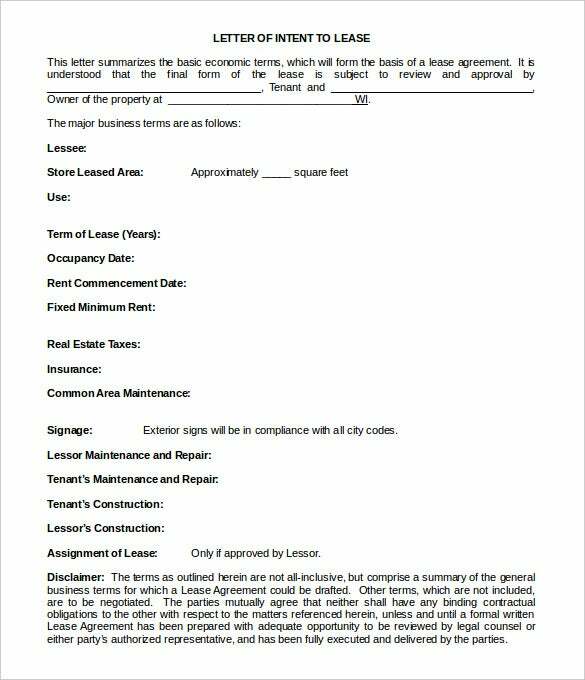 A simple letter of intent comes with the information about a proposed contract and you will get free letter of intent template today to help you in formatting a LOI easily. It could be for a real estate transaction or a business deal or for a cover letter to be sent with a professional resume. 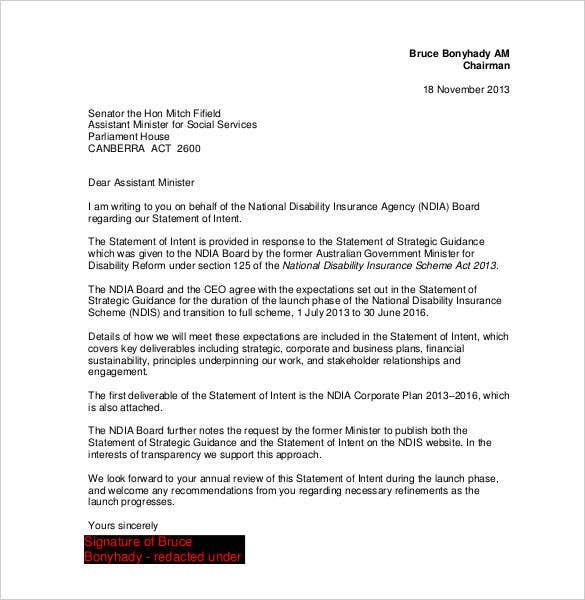 The letter is meant as a prelude of the contract that would be signed later. 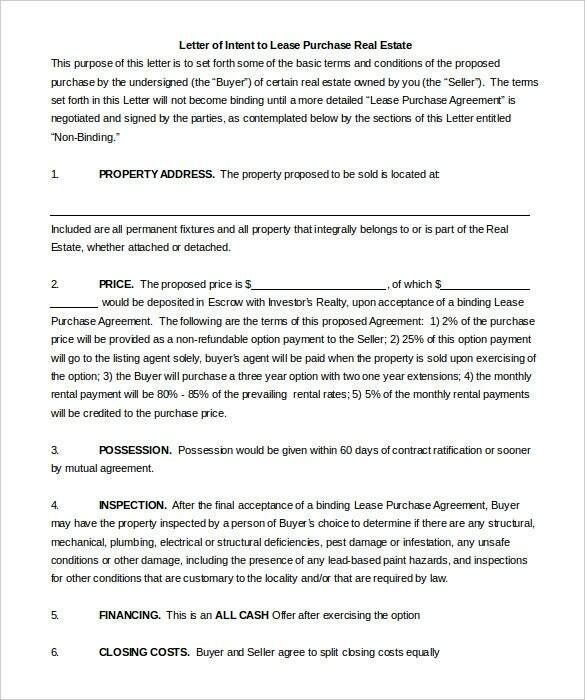 A letter of intent example includes details about the parties to be involved in a contract or deal. 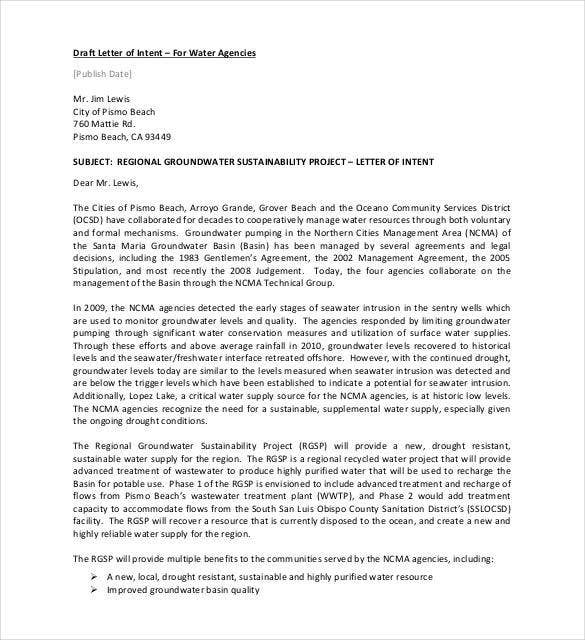 Such a letter also provides information about the purpose of the deal such as a business merger or property purchase and so on. What is a Letter of Intent to a College? 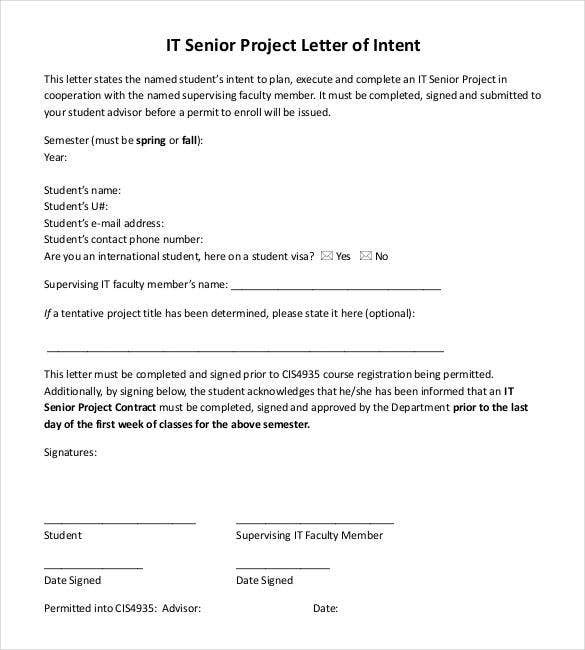 A letter of intent to a college is also known as a college interest letter which is often a requirement to gain admission into high school, medical or graduate college or even a dental university. 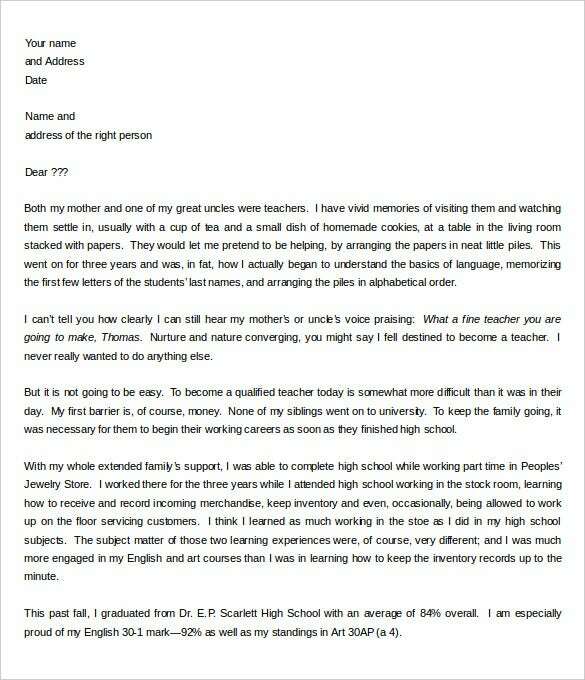 The letter is written by the candidate expressing his interest in a particular course and his qualifications to join it. He may also be required to explain why he wants to join the college. 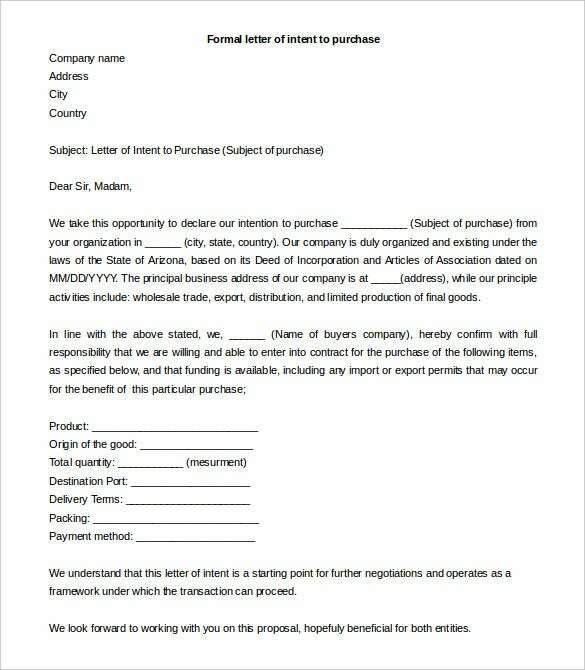 The format for such a letter can be easily found in the various Letter of Intent Templates in Word that are readily available online. However, he may have to do some research before beginning to write the body of the letter. 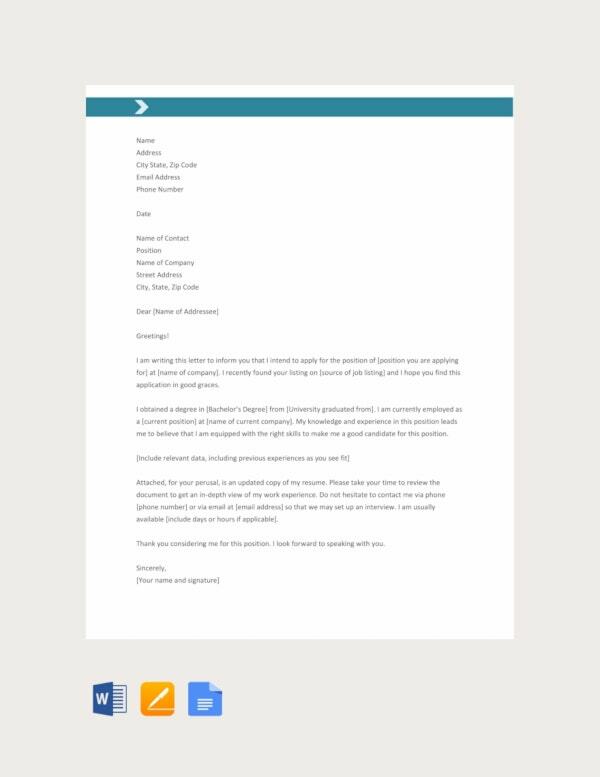 Whether you are writing a letter of intent to gain a dealership or to grab the attention of an investor for organizing an event or to request for a donation for a hospital, it is important that you follow the perfect format while also composing an impressive letter. 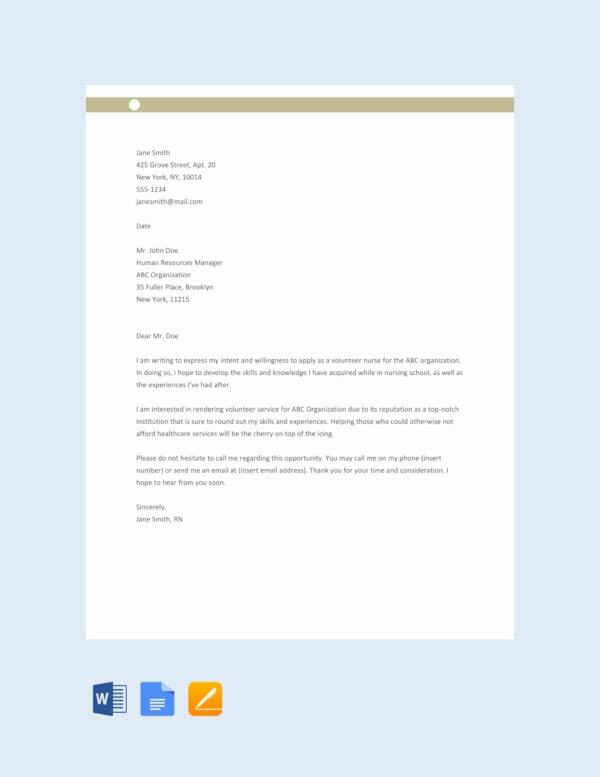 Taking a quick look at Real Estate Letter of Intent Templates gives you an idea of the format. 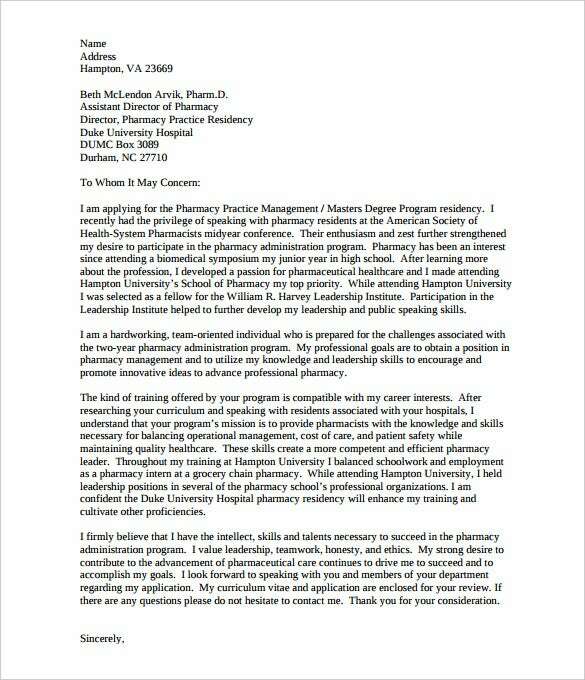 Here is how you can write a letter of intent. Start with the date on which you are writing the letter. Below this give the name and contact details of the recipient. This should be followed by the subject that expresses the reason for writing the letter. Next should be a proper salutation. Make sure to address the recipient directly. The first line of the letter should clearly state the reason for which you are writing the letter. Then go on to write the body of the letter which should be followed by a proper conclusion. If you want to purchase some property, you should begin by writing a letter of intent to the seller. This includes the basic details of both and terms. The template is available in PDF format. 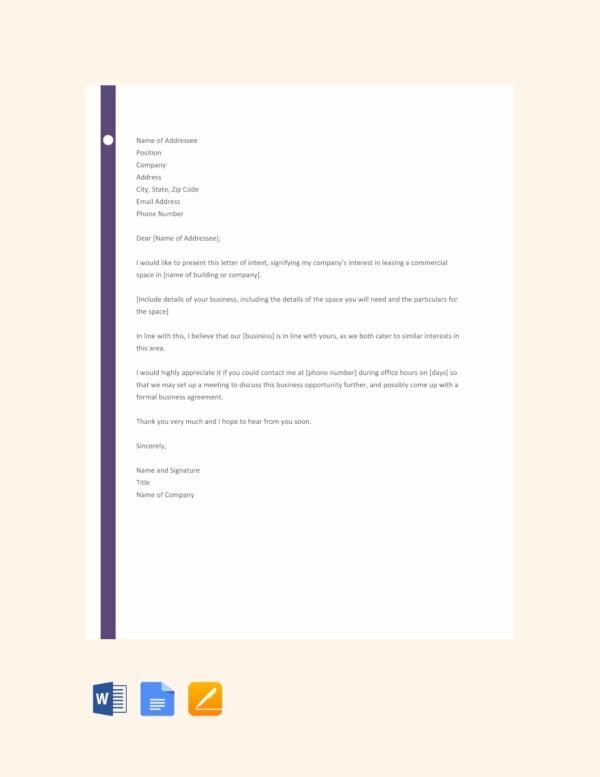 You may also see Business Letter of Intent Templates. 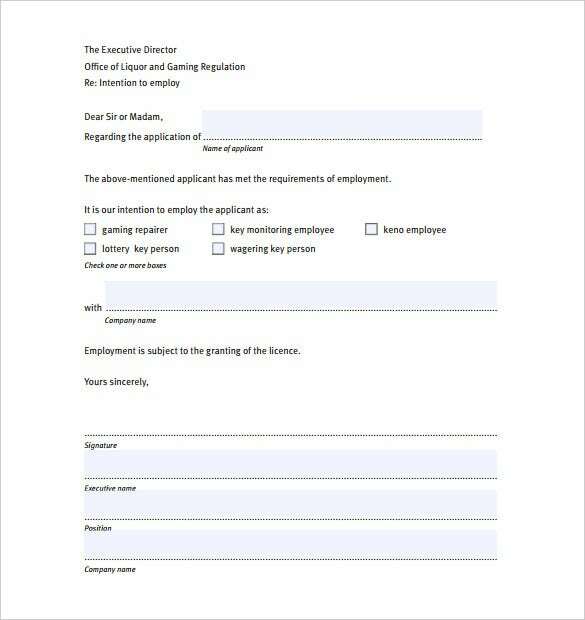 If you are seeking employment in a government department, this PDF template will guide you to write the right letter of intent. Download it today and fill in your details. 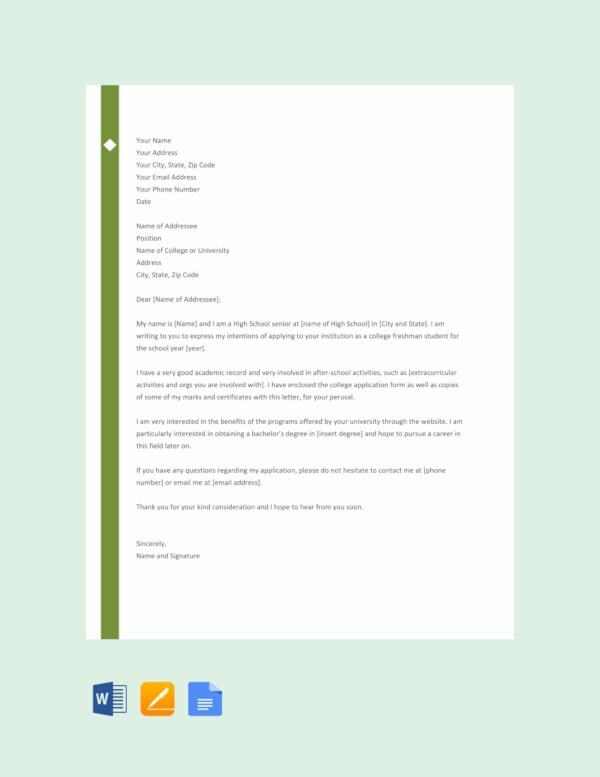 You may also see School Letter of Intent Templates. In order to get into a college program to study a degree a letter of intent is required. 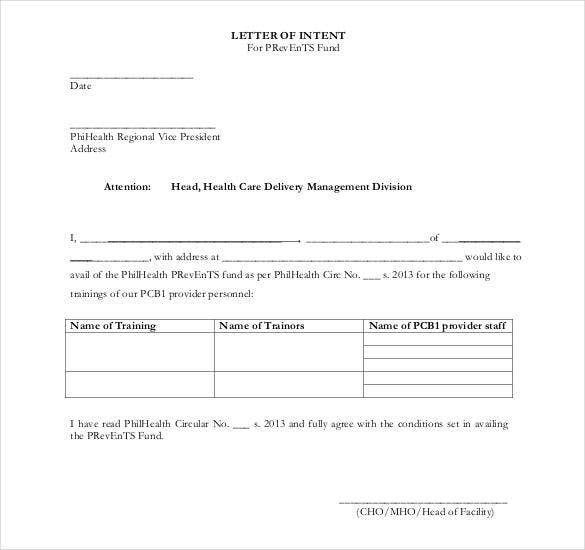 This PDF template is designed to help you easily write the letter. 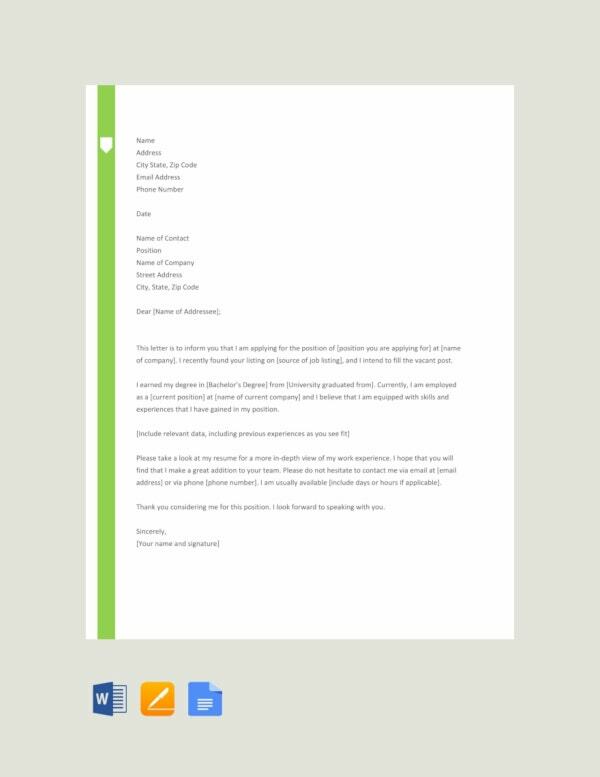 You may also see Free Intent Letter Templates. If you want to purchase some asset or property, start by writing a letter of intent to show your interest. 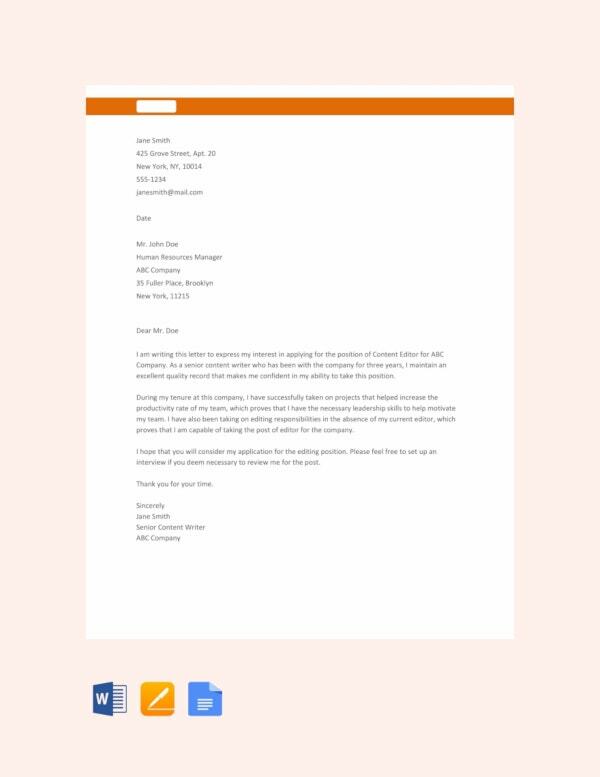 Using this Word template as a guide, you can write a good letter. 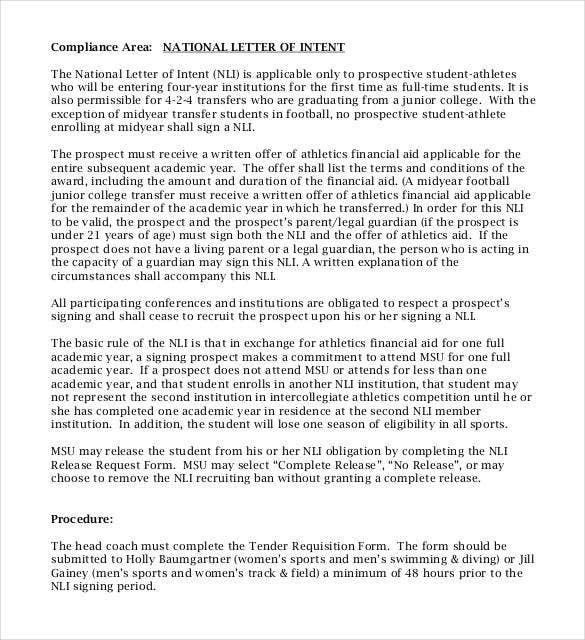 You may also see National Letter of Intent. 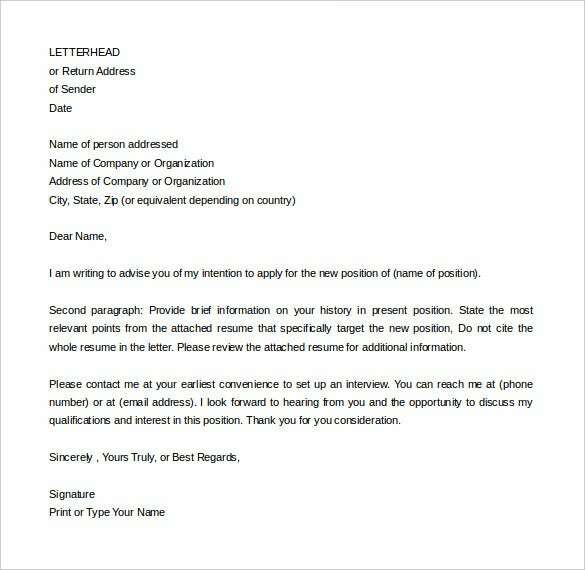 In order to show your interest in a new job position available at a company, a letter of intent is needed. Use this Word sample to produce the letter as required. 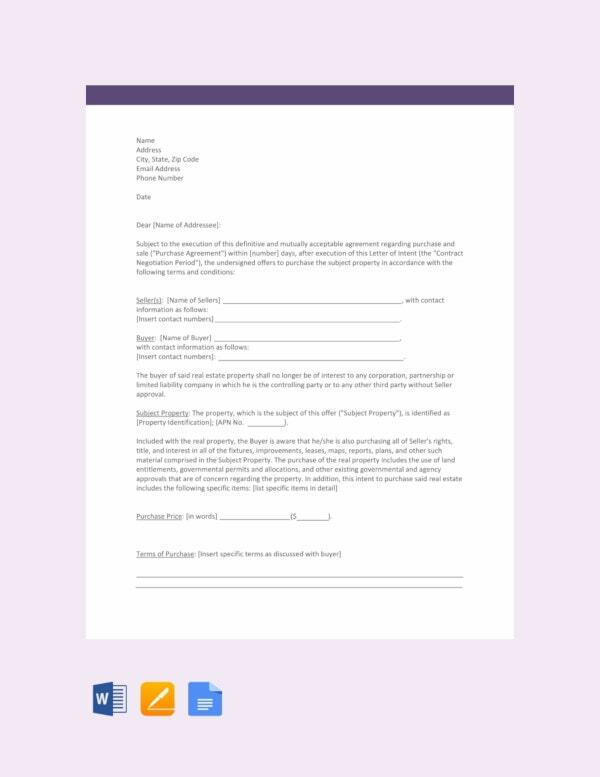 You may also see Letter of Intent Templates Download. So as to express your interest in working as a teacher at Scarlett high school, a letter of intent is necessary. We have this Word sample letter to help you say what’s in your mind. 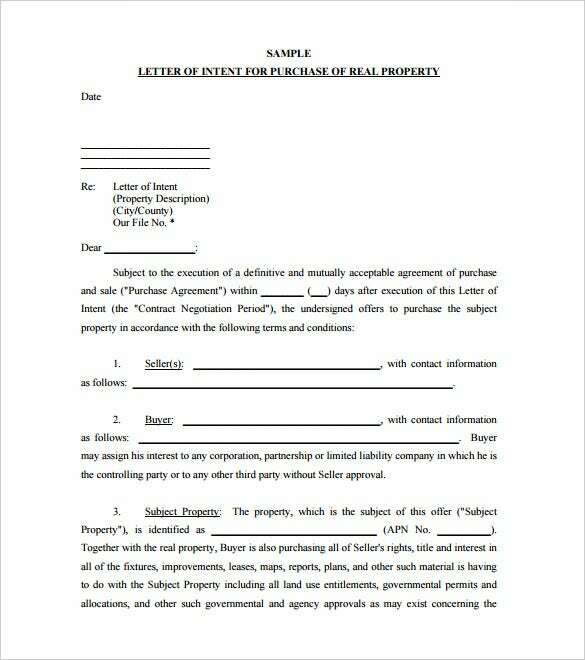 Before going into the negotiations to buy some real estate, a sample free Letter of Intent form one of the parties is necessary as it sets out he terms. Use this Word template as a start. 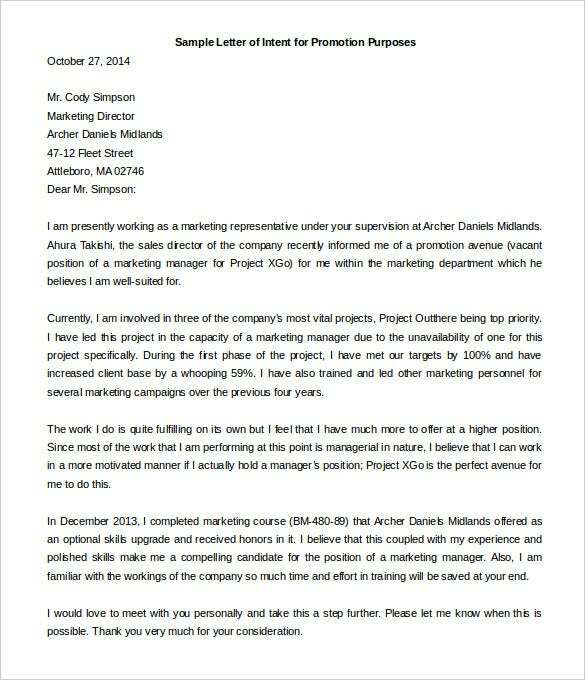 If you want to let your superiors know of your interest in the vacant position of promotion , use a letter of intent. With this Word sample letter, all you have to do it replace the words with yours. 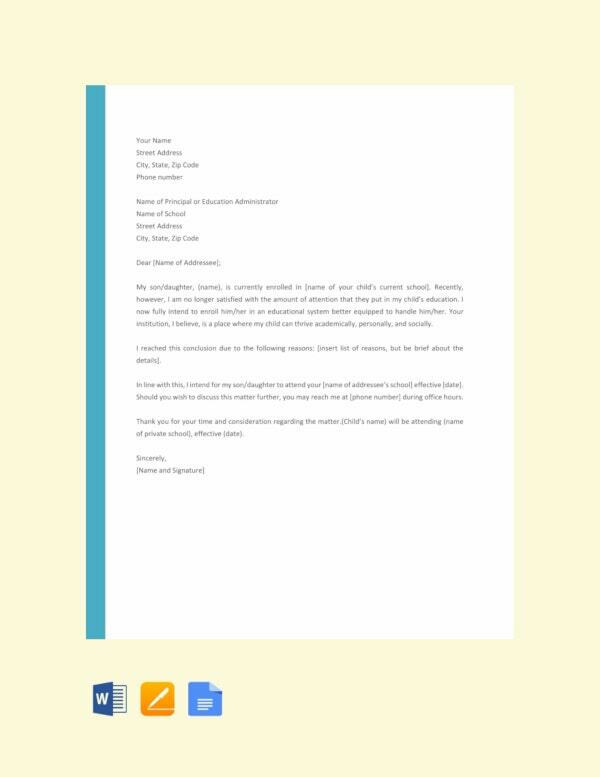 You may also see Promotion Letter Formats. What should be done before Signing the Letter of Intent? 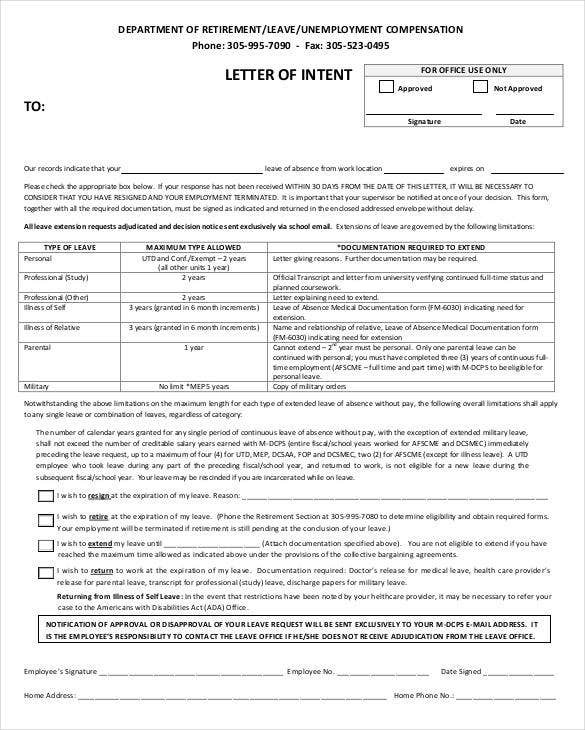 A person who is involved in writing a letter of intent can get some cue about the format and the layout by taking a look at Sample Employment Letter Of Intent Templates. However, a person should take some special care before signing a letter of intent. Here is what he is supposed to do. 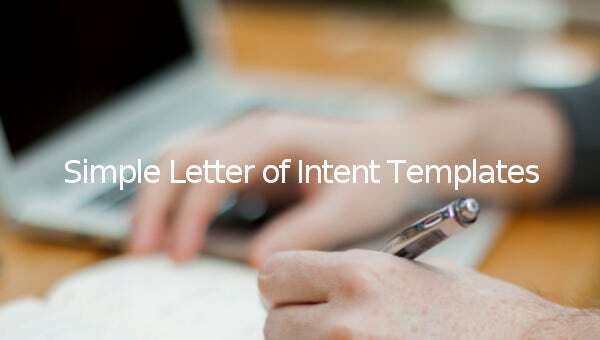 Irrespective of whether you have drafted a letter of intent using the Letter of Intent for Job Templates or any other template for that matter, you can surely do with some tips to write an impeccable letter. Here are a few tips to help you out. 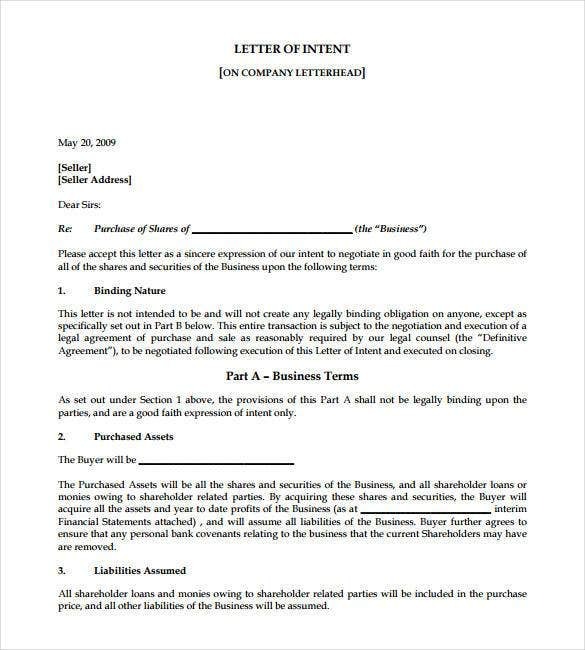 The letter of intent is an essential part of the business world and has a lot of uses. Let us take a look at what these are. 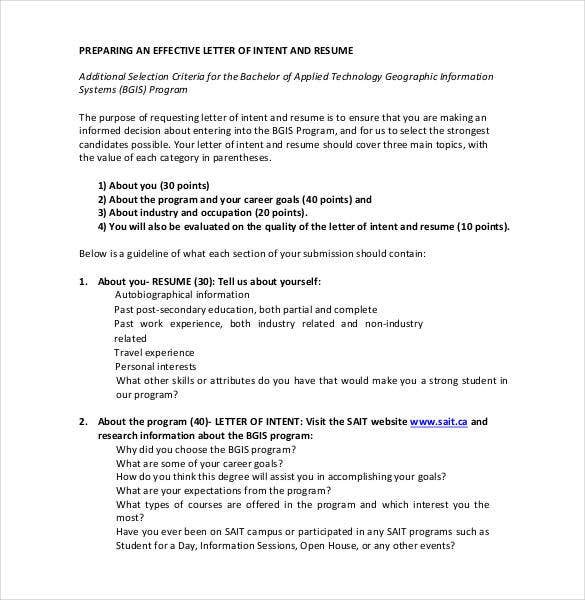 Not sure how to write a Letter of Intent? Well, we have a vast collection of such letters in our collection. Check this out and pick the one that is perfect for your needs. Designed by experts, these letters are totally in sync with the latest industrial trends. 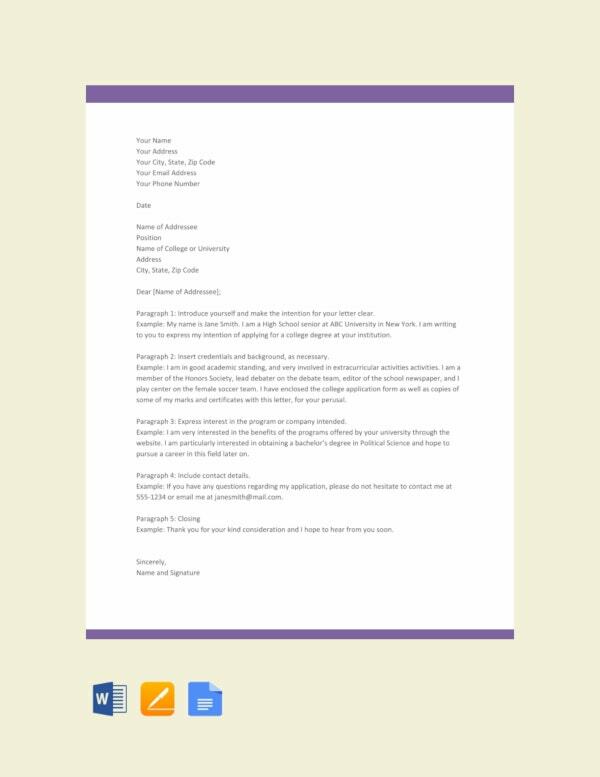 Thanks to the ease of downloading and customization that these offer, you can easily draft an impressive letter of intent.